There are so many good things going on right now. I feel like everything is clicking.. Since it is a mishmash of topics will use list form..
-I finally joined Twitter, I felt like I was missing out on a whole world with my Runner Buddies. If you are on Twitter please consider Following me J I am hoping to host a Twitter related Giveaway this week! I am in Social Media overload.. You can follow me on Facebook HERE, Twitter HERE and DailyMile HERE. -I am LOVING my new job. I get off at 3:30 every day, my commute is only 25 minutes (not including the coffee stop), and the stress level is way down. This life change is just what I needed. Sometimes taking a leap of faith can land you exactly where you should be. 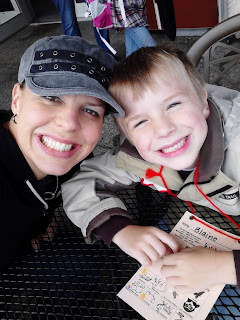 Last week I got to attend LS #1's Kindergarten Zoo Fieldtrip... so much FUN! -It is my Birthday week!!! I turn 33 this Thursday, Flag Day. If you have read this Blog for more than a minute you know that 33 is my favorite number, so this year is bound to be AMAZING. 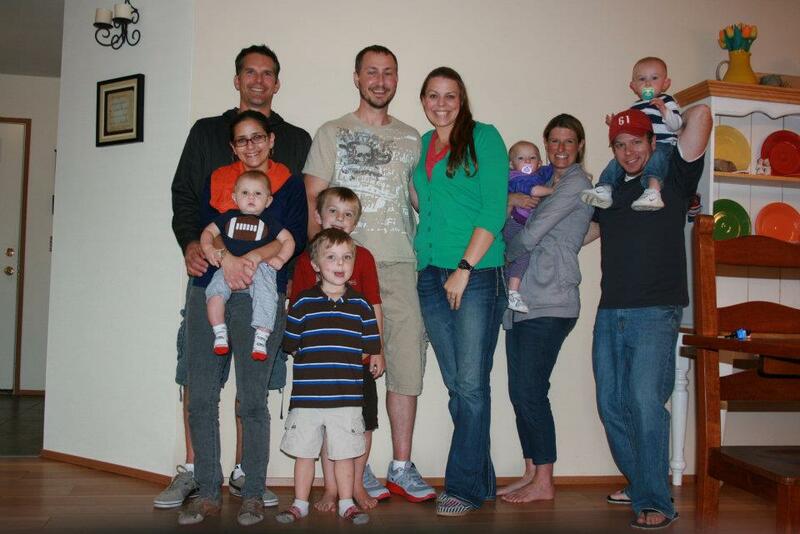 This weekend I celebrated with my college friends, it was so much fun! They have growing families, so seeing all the kids together was a blast. I may have had a bite of carrot cake for breakfast this morning.. 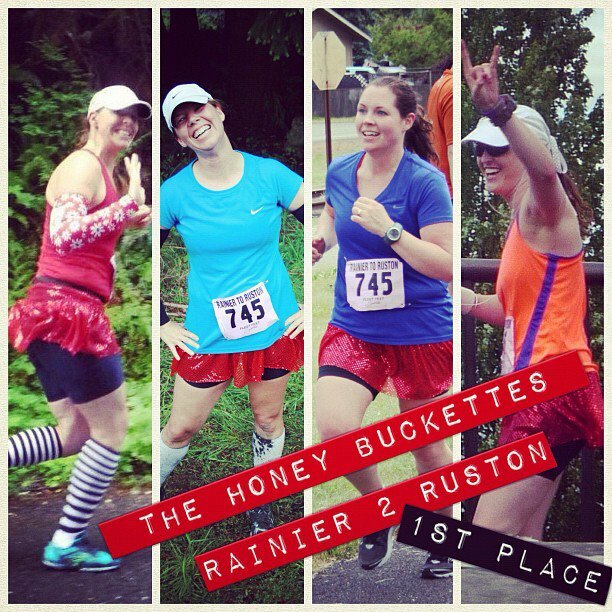 It is my Birthday week, don’t judge..
-Team Honey Buckettes earned 1st place in the Female 4 person Division!! This meant we won Golden Spikes from Rainier to Ruston and since we made the “podium” wearing our Team Sparkle Skirts we also won skirts. I am still on a high from this relay, although I felt horrible that day, all I can think about is how much FUN I had with my friends. -It is amazing when you get an unexpected comment, the Runner we stayed behind in the Relay who was Finishing the 50+ miler commented on my last post. So excited!! Congrats again, mad respect. Speaking of crazy AMAZING Ultra Runners check out Dailymile and give props to my friends: Janice HERE ran 52 miles in the middle of the night and Shelly HERE ran 62 miles while continuing her running streak of 764++ Days and counting!! -My friend Janna recruited me to run the White River 5K HERE this Saturday.. should be FUN! Check it out, there is still time to Register! Not sure what pace I will run for this, but I plan to Sparkle. Muscle Man may run too if we can find a Kiddo Sitter..
-Rock N Roll Seattle is right around the corner!! I look forward to this event every year... Thursday night I will be attending a Run Like a Mother the Book get together!! Friday afternoon I am working with RNR to have a Blogger meet-up at the Expo, details soon! 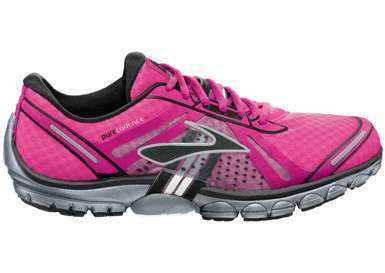 Generally I host a Bloggy Dinner on Friday night but this year I have been invited to a special Blogger Online Shoes/Brooks Running Event. Since it is a new start line I am not sure where to meet for a pre-race photo?? As always we meet up in Family reunion area "B" for Blogger. Top from JCPenneys for $17, I also got a skirt for $17. Pure Project shoes should arrive this week, pretty sure you NEED these too, buy them HERE. It is a little WILD, but hey it is Rock N Roll Baby!! I am excited to run the Half Marathon, I registered for a 1:45 Half…oops, I think last year I had visions of training FAST. I am in Corral #4, I may move back with my friends, will see how training goes the next weeks. Will I run solo??? -Muscle Man and I have a Half Marathon on June 15th Fueled by Fine Wine In Dundee, OR, so we are back to training. We ran a 10 miler on Sunday, following the path I learned at the Relay. Poor guy was not feeling his best but he pushed through. 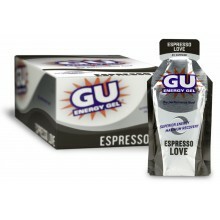 I tried Espresso Love Gu for the first time. YUMMERS!! It is like a mid run coffee break and gave me the pick-me-up I needed. -Loads of Reviews coming tomorrow- Handheld Water bottle, Garmin 310XT, Moving Comfort outfit, Champion Bras and their new website, and more…. Check in for “Test Lab Tuesday” tomorrow. What is new in your world?? Share a “Good Thing” or two or three, in a comment. So excited for RNR Seattle - I can't wait to meet everyone! I'm glad you are loving your new job! yay! so awesome to (read) hear you happy!!! It sounds like things are really working out well for you. Congrats! What's new in my world, you ask? Yesterday I finished my 20 mile run to top out my long runs for my first trail marathon (second overall marathon) next month. Now I'm focusing on hill work until taper time. LOVE your RnR Seattle outfit!!! Awesome that you and MM are tackling another half together already. So happy for you both! YAY Twitter! Although, I have no time for it lately and feel out of the loop myself. Not enough hours! Started training for half #6, registering for half#7 and #8. Summer hours at work start this week. I am on the Dragon Boat team for breast cancer survivors. Had stable scans. Life is good! I ran the white river 5k last year. It is a fast and flat course. I got second in my age group (35-39) last year and I am NOT fast. 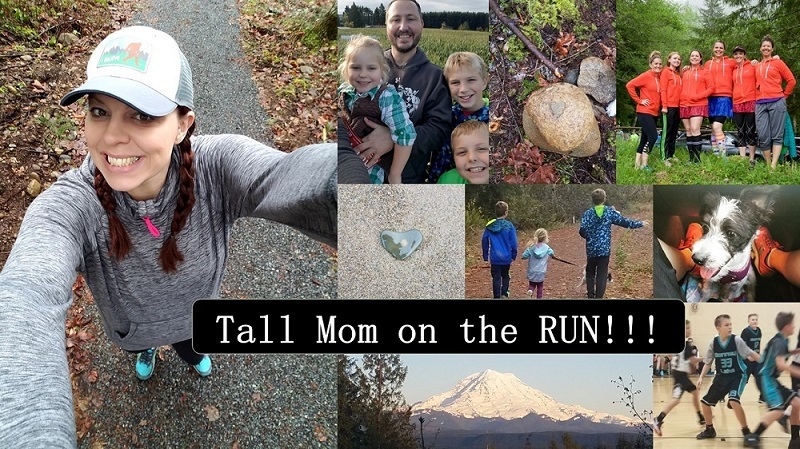 I am running RnR Seattle this year also, just the half. It is my half#2 and I am so nervous/excited. Love your outfit. Still trying to decide/finalize mine.